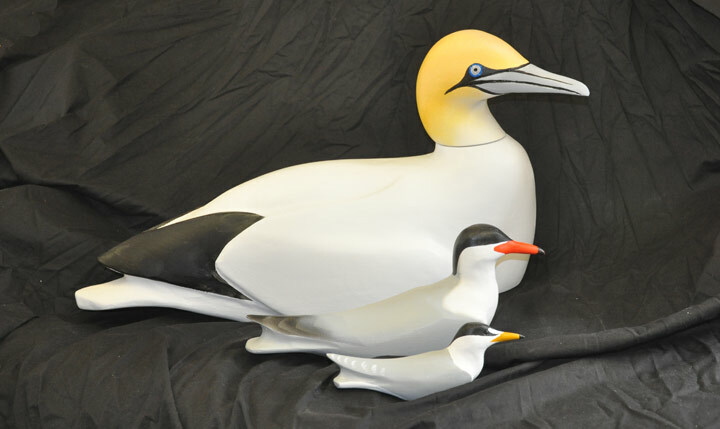 These Northern Gannet decoys were designed for a restoration project in the Netherlands. Large birds, these are a bit over life size, with a body length of 60cm (about 24"). Once the head is added the overall length approaches 74cm (30"). The head, by the way is separate and attaches to the body with a dowel so that it can be turned to any position desired. Like our other restoration decoys, these are carved of pine and cedar, sealed with a marine sealer and color coated with highly durable acrylic finishes. They are intended to be used on land, so are not hollow bodied like floating decoys. Unless you happen to be very familiar with these birds, measurements alone mean less than photos, so here is one featuring a Gannet together with one of our Common Terns and a Least Tern. The Gannet in the photo features the S-shaped neck; the one in the photo below features the semi-alert nesting pose. Regardless of the pose, the bodies are hollowed to reduce weight and bored to sit on rods driven into the ground. Semi-alert or more relaxed, these are impressive decoys. 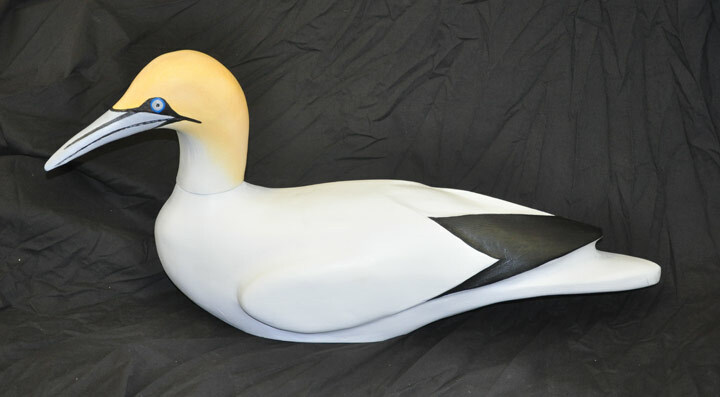 our Northern Gannet decoys are sure to stand out in any collection.